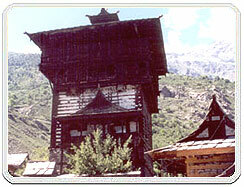 The state of Himachal Pradesh was called 'Deva Bhoomi ' or the Land of the Gods. There are evidences of the existence of the pre-historic humans in this region. It is generally believed that large inhabitants of this region had actually migrated from Central Asia and the Indian plains from time to time. The first race to enter Himachal Pradesh was Proto-Australoid followed by Mongoloid and the Aryan. The Rig Veda mentions about Dasyus and Nishads living in this region and their powerful king Shambra who had 99 forts. From the early period of its history, tribes like the Koilis, Halis, Dagis, Dhaugris, Dasa, Khasas, Kinnars and Kirats inhabited it. The Aryan influence over this area dates back to the period before the Rig Veda. The Aryans with their superior war tactics defeated the local tribes and settled here permanently. The period also saw the establishment of small Janapadas or Republics in Himachal Pradesh. They maintained a good relationship with the Mauryans so that they can remain independent for a long time. They lost their independence with the rise of the Guptas in the North Gangetic plains. After the decline of the Guptas, several small kingdoms ruled this hilly state and established their power in its different regions. Sankar Varma, the king of Kashmir exercised his influence over the regions of Himachal Pradesh in about 883 AD. This region witnessed the invasion of Mahmud of Ghazni in 1009 AD. In about 1043 AD, the Rajputs ruled over this territory. The Mughal rulers erected several works of art as an admiration of this land. The Rajputs, under the leadership of Sansar Chand owned this region in 1773 AD, till the attack by Maharaja Ranjit Singh in 1804 AD, which crushed the Rajput power here. The Gurkhas conquered this area and ravaged it. In about the early 19th century AD, the British exercised their influence and annexed the areas of Shimla after the Gurkha War of 1815-16. The British established many hill stations in this region to protect themselves from the extreme heat and dust of the northern plains in the summer. Shimla became the summer capital of India and even today, many old houses and buildings tell the story of English grandeur. Himachal Pradesh was made a centrally administered territory in 1948 with the integration of 31 hill states and obtained additional regions in 1966. It had the status of a union territory after independence till it was granted statehood in 1971. According to the Mahabharta the tract which forms the present day Himachal Pradesh was made up of number of small republics known as Janpadas each of which constituted both a state and cultural unit. The were the most prominent ancient tribes of Himachal who lived in the lower hills between Pathankot and Jwalamukhi. They formed a separate state in 2 B.C. The state lay in the foothills drained by three rivers, i.e. Ravi, Beas and Satluj and hence the name. It is believed to have been an independent republic. The kingdom of Kilita was situated in the upper Beas valley which is also known as the Kully valley. Its capital was Naggar. This kingdom covered the area lying between the Beas, Satluj and Yamuna rivers, i.e. the Shimla and Sirmour hills. Their administration resembled a republic with members of a central assembly sharing the powers of the king. Chandragupta slowly subdued most of the republics of Himachal by show of strength or use of force though he usually did not rule them directly. Ashoka, the grandson of Chandragupta extended his boundaries to the Himalyan region. He introduced Buddhism to this tract. He built many stupas one of which is in the Kullu valley. After the collapse of Gupta empire and before the rise of Harsha, this area was again ruled by petty chiefs known as Thakurs and Ranas. With the rise of Harsha in the early 7th century, most of these small states acknowledged his overall supremacy though many local powers remained with the petty chiefs. A few decades after Harsha's death (647 A.D.) many Rajput states ascended in Rajsthan and Indus plains. They fought amongst themselves and the vanquished moved to the hills with their followers, where they set up small states or principalities. These states were Kangra, Nurpur, Suket, Mandi, Kutlehar, Baghal, Bilaspur, Nalagarh, Keonthal, Dhami, Kunihar, Bushahar, Sirmour. The small hill kingdom enjoyed a large degree of independence till the eve of Muslim invasions in northern India. States of the foothills were devastated by Muslim invaders from time to time. Mahmud Ghaznavi conquered Kangra at the begining of the 10th centuary. Timur and Sikander Lodi also marched through the lower hills and captured several forts and fought many battles. Later on as the Mughal dynasty began to break up; the rulers of the hill states took full advantage. The Katoch rulers of Kangra availed of this opportunity and Kangra regained independence status under Maharaja Sansar Chand who ruled for nearly half a centuary. He was one of the ablest administrators of the region. After he took formal possession of Kangra fort, Sansar Chand began to expand his territory. The states of Chamba, Suket, Mandi, Bilaspur, Guler, Jaswan, Siwan and Datarpur came under the direct or indirect control of Sansar Chand. Anglo-Gorkha and Anglo-Sikh War: The Gorkhas, a martial tribe came to power in Nepal in the year 1768. They consolidated their military power and began to expand their territory. Gradually the Gorkhas annexed Sirmour and Shimla hill states. With the leadership of Amar Singh Thapa, Gorkhas laid siege to Kangra. They managed to defeat Sansar Chand, the ruler of kangra, in 1806 with the help of many hill chiefs. However Gorkhas could not capture Kangra fort which came under Maharaja Ranjeet Singh in 1809. After this defeat the Gorkhas began to expand towards south. This resulted in the Anglo-Gorkha war. They came into direct conflict with the English along the tarai belt after which the English expelled them from the hill states east of the Satluj. Thus British slowly emerged as the paramount powers in this tract. After the Anglo-Gorkha war the common border of the British domain and Punjab became very sensitive. Both the Sikh and English wanted to avoid a direct conflict, but after the death of Ranjit Singh, the Khalsa army fought a number of wars with the British. In 1845 when the Sikhs invaded the British territory by crossing the Satluj, the rulers of many hill states sided with the English as they were looking for an opportunity to settle scores with the former. Many of these rulers entered into secret communication with the English. After the first Anglo-Sikh war, the British did not restore the hill territory vacated by Sikhs to their original owners. Revolt of 1857: The revolt or first Indian war of independence resulted due to the building up of political, social, economic, religious and military grievances against the British. People of the hill states were not politically alive as the people in other parts of the country. They remained more or less aloof and so did their rulers with the exception of Bushahr. Some of them even rendered help to the Britishers during the revolt. Among them were the rulers of Chamba, Bilaspur, Bhagal and Dhami. The rulers of Bushars acted in a manner hostile to the interests of British. However it is not clear whether they actually aided the rebels or not. British Rule 1858 to 1914: The British territories in the hill came under British Crown after Queen Victoria's proclamation of 1858. The states of Chamba, Mandi and Bilaspur made good progress in many fields during the British rule. During the first World War, virtually all rulers of the hill states remained loyal and contributed to the British war effort both in thr form of men and materials. Amongst these were the states of Kangra, Siba, Nurpur, Chamba, Suket, Mandi and Bilaspur. RAIL - Only few places in Himachal Pradesh are connected by trains, as the construction of new lines are very difficult in the rugged, high altitude regions. The longest railway line is from Pathankot in Punjab to Jogindernagar in Himachal Pradesh. Other railway tracks touch Shimla, Solan, and Una. Air: The state has three airports at Bhuntar, Gaggal, and Jubbarhatti, which connect the state to Delhi and Chandigarh via regular flights by Indian Airlines. There is no international airport in Himachal Pradesh. Rail: Only few places in Himachal Pradesh are connected by trains, as the construction of new lines are very difficult in the rugged, high altitude regions. The longest railway line is from Pathankot in Punjab to Jogindernagar in Himachal Pradesh. Other railway tracks touch Shimla, Solan, and Una. Road: Despite problems in constructing new roads and maintaining them, most of the important places in the state are connected with a good road network. Some of the roads are closed during the winter and monsoon seasons due to the heavy snowfall and landslides that occur regularly in this region.